After making my Jasmine Fried Rice recipe several times, my sweet and friendly neighbor has now requested (very strongly) that my Thai Basil Chicken Recipe be posted. I made this last Sunday -- just to get the ingredients perfected. One of our teenage sons came over and hugged me when he discovered I was making his favorite dish. Then harassed me to 'hurry up' as the wonderful smell of basil flowed throughout our home. Here it is neighbor and Parsnips and New Mace friends! 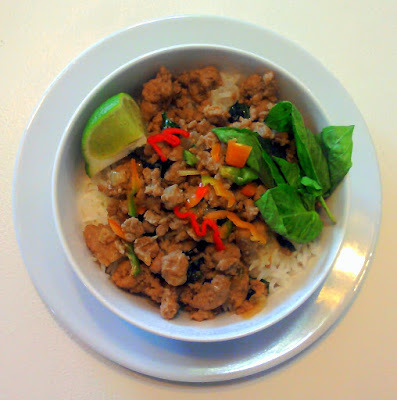 1) As this is best over fresh, steamed rice, get that started and going, so it is ready when your dish is complete. 2) In a skillet, add vegetable oil and turn to medium. 3) Add diced onion and garlic and saute until onions have a glossy transparency to them. 4) Tear up 2/3 of your fresh basil and add it to the sauteed onion/garlic. 5) If you like things spicy, then add 2/3 of your fresh, hot peppers now as well. 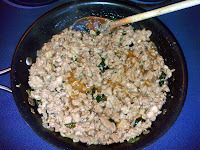 6) Stir for a few minutes, then add your ground chicken or turkey and turn your heat to medium high. 7) Stir often as the meat is browning, and cooking through. In a bowl, combine your syrup (or honey) with chicken stock and fish sauce and stir well. In a separate small bowl, combine soy sauce and cornstarch until completely mixed, then add to honey mixture. 9) When meat has cooked through, give your sauce one more good stir and then add it to your skillet. As it starts to bubble, turn the heat to medium low and stir frequently for a few more minutes while sauce thickens. 10) Your meal is ready now. 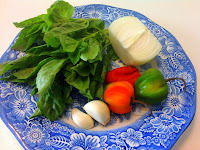 You can garnish each serving with a few more basil leaves, a lime wedge and hot peppers. Serve over fresh, steamed rice. For years I wondered why my meals would not taste as good as some of my father's restaurant dishes. It was then I learned the distinct taste that fish sauce lends to Asian meals. 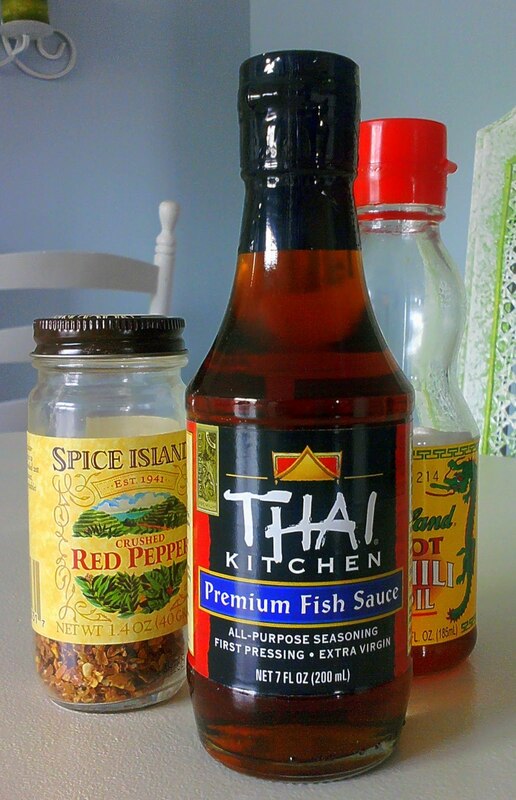 Fish sauce is normally used in small quantities and is needed to bring that 'just right' flavor. 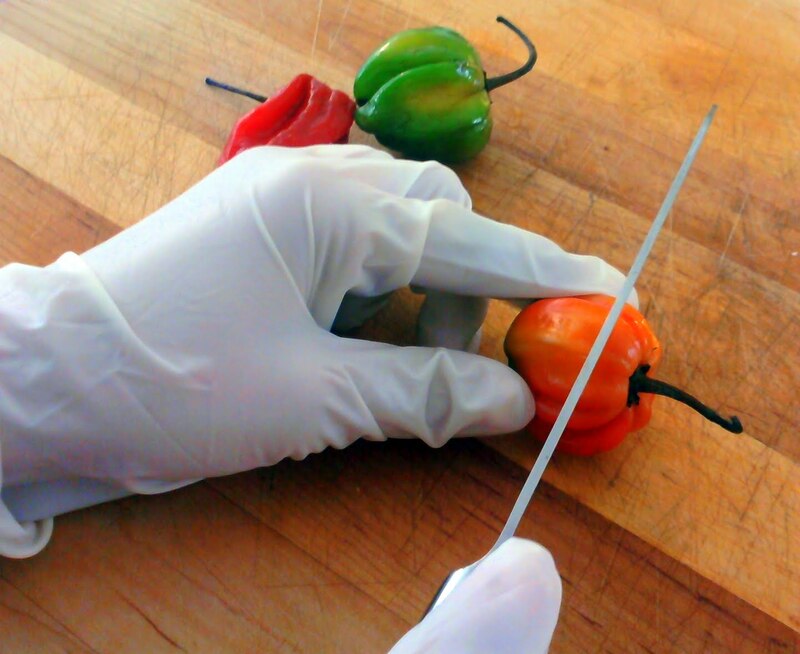 Do not make the same mistake I did when chopping and removing seeds from your peppers. Always wear gloves when you do this. Removing seeds will make your dish 'less' spicy -- so if you like it hot, you may want to add it with the seeds. * I sometimes just use a couple drops of hot chili oil or dried red peppers as an alternative to the fresh peppers. If you like to roam around Asian food markets, you can find all types of interesting ingredients. 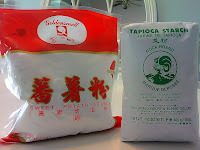 For variety I sometimes use sweet potato or tapioca starch. I find them very inexpensive too.